When Harvesting Garlic, Timing is Everything! The right time for harvesting garlic is not determined by the appearance of the bulbs, as they are buried and not visible. Instead, you have to look at the leaves. Once the foliage has turned brown and died back, it's probably time to harvest. The timing of the harvest is very important. 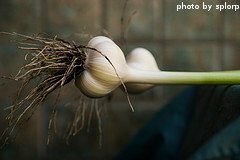 If you gather the garlic too early, the cloves will be smaller and less compact. If you wait too long to harvest the garlic, the heads may be split and the cloves may have begin to rot. The best way to "time" the harvest correctly is by the appearance of the foliage. However, soil moisture levels can drastically affect the timing of the harvest. If the soil is fairly wet for a long period of time due to heavy rainfall, the garlic may be ready to be harvested while the foliage is still slightly green. On the other hand, if you are experiencing dry conditions, the foliage may die back before the best time for harvesting garlic has arrived. Before the garlic is ready for harvest, the plants will send up a scape, which is a long, round, green, curly, whimsical-looking shoot. It comes up from the center of the plant and has a small bulging area at the end. If left alone, this will open up into a flower. You'll want to cut off the scape, which will re-focus the plant's energy into producing a bigger and better bulb. Pay attention to the soil moisture levels when the foliage begins to turn brown. Let these moisture levels help you determine when it's time to harvest. You can also cut off the tops of one of the plants when they begin to turn brown. Peel back the sheaths, one layer at a time. If there are 3-4 sheaths, you can go ahead and harvest. If, on the other hand, there are 5-6 sheaths or more, leave the garlic in the ground another couple of days and check again. Another rule of thumb is to harvest your garlic when there are still 4 green leaves on the tops. As the plant matures, the leaves on the tops will turn brown. However, they won't all turn brown at once. Typically the thinner leaves will brown first. By harvesting garlic when there are still 4 green leaves left, you will ensure that there is enough wrapping to protect the bulb for long storage. To harvest the garlic, dig into the ground around the plants with a pitchfork, being careful not to damage the bulbs. After turning the soil over, collect the heads of garlic. After harvesting garlic, it's critical to cure the heads in a warm, dry place for at least a week. Do not wash the heads at this time. Instead, hang the garlic up to dry or spread the heads on a table. A garage or shed is a good location for curing. It will keep the bulbs dry and out of the sun. If the garlic heads sit too long in the sun, they will actually burn slightly, which may produce a bitter taste. 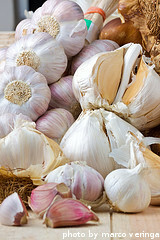 Once the garlic has cured for at least a week, use a dry brush and brush the dirt off of the heads. You can then trim off the roots, being careful not to damage the cloves. 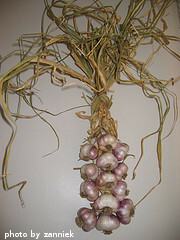 The garlic heads are now ready to be braided together and hung up for long term storage. Properly cured garlic will last for several months if hung in your kitchen or pantry away from the stove. Long term exposure to steam or excess moisture might damage the bulbs and cause them to spoil more rapidly.